I was recently introduced to the ‘one-of-a-kind’ handcrafted pieces of functional art designed by Ron at Ostlund Custom Works. Each piece struck me as not only original and well manufactured, but overtly Steampunk as well. And as Mr. Zouch, that good ol’ revered English gent, loves to share great new luminaries in the steampunk genre with his readers, he has asked (read ‘demanded’) that I do his bidding. 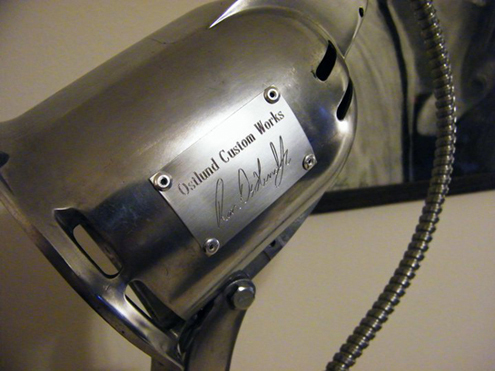 So here are some featured pieces from Ostlund Custom Works. If you like what Ron does, don’t hesitate to visit his store on Etsy and get your own Steampunk’ish lamp or clock! 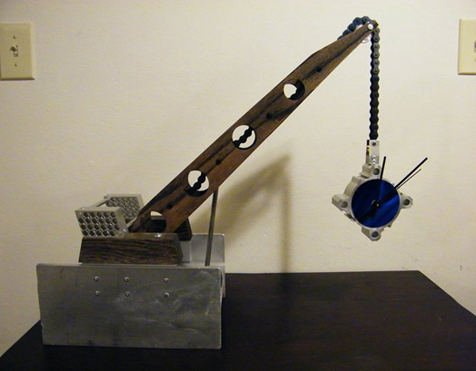 The Main structure is made from upcycled metal and the electrical is all new. The bottom pieces are air cylinder parts. An Edison replica bulb. 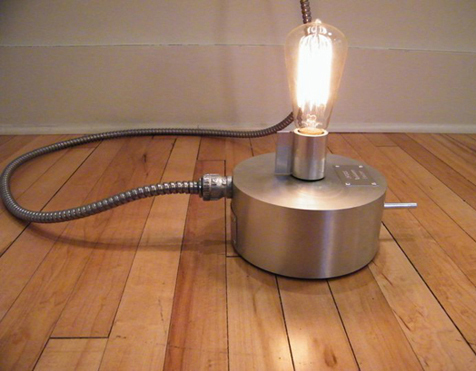 The lamp is turned on and off with the aluminum rod in the front, you simply pull or push to turn on or off. The flex conduit cord, and engraved plates really add style and texture to a stark industrial look. A tribute to the Machine Age of Art. The chain has been blued with a torch for added depth of color. 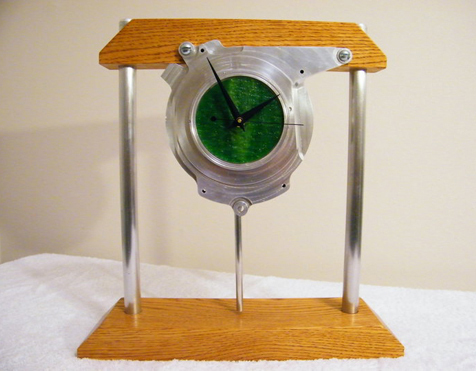 The clock features a continuous sweep movement and has a blue glass face. 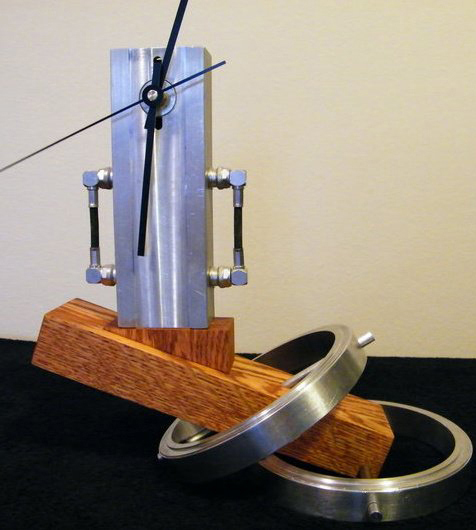 All the metal is upcycled and it features an asymmetrical shift of time as it passes through a collapsing portal. 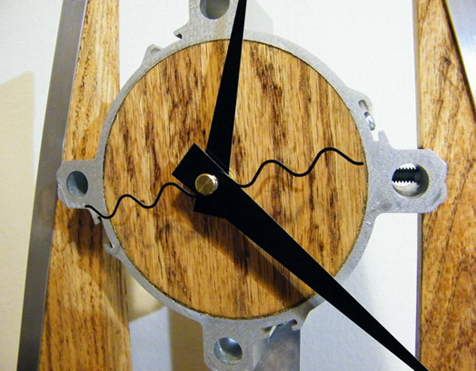 This clock features a regular ticking type movement with pendulum. 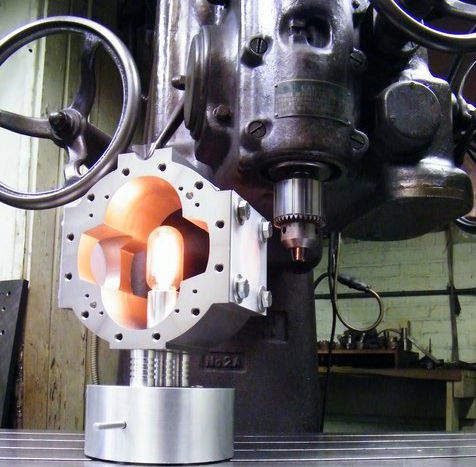 The uprights are oak and aluminum, the face is oak and aluminum pneumatic cylinder tubing from PHD inc.
All of the metal used in “Green Fusion” came from Huth Machine shop. The rest of it is solid oak and is finished with an amber shellac and wax. The face is Green glass with a whitish streak down the center.